The Joint Contracts Tribunal Standard Form of Building Contract, JCT 98, is now a well established and widely used form. That is not to say, however, that it is always well understood. It is a large, complex contract with a number of particularly difficult provisions. It is not surprising, therefore, that not much guidance has been published on the form. This book, first written by John Parris in 1982, and revised in 1985, was widely regarded as a valuable commentary on the Standard Form. Unavailable for some years, it has now been substantially updated and completely rewritten by David Chappell. Major changes have occurred since the last edition, including a raft of amendments to the contract itself, much new legislation including the Housing Grants, Construction and Regeneration Act 1996, and substantial new case law. The book covers all these as well as the complex performance specified work provisions and the difficult problems of nomination. The nominated sub-contract conditions are referred to where appropriate, and the book contains guidance on related matters, such as warranties, letters of intent and quantum meruit. The book will provide a valuable reference for clients' professional advisers and contractors, as well as for lawyers needing an introduction to the contract. 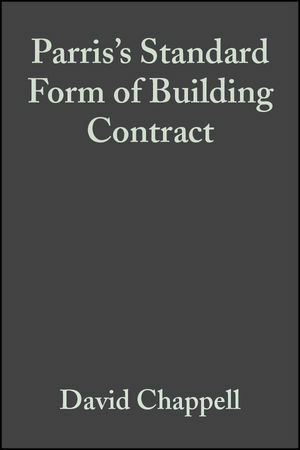 Background to the contract, documents and some key provisions; The role of the architect and quantity surveyor; The contractor's obligations; Sub-contractors, suppliers and statutory undertakers; Certificates, payments and retention; Variations and their valuation; Liquidated damages and extension of time; Insurance provisions; Determination before completion; Claims and counterclaims; Dispute resolution; Practical completion, defects liability period, the final account; Table of cases; Clause index; Subject index. "Look, if you are taking part, or even thinking of taking part, in a JCT98 adventure, buy the book, but don't put it on the shelf. Read it! And if you don't read the rules, I look forward to seeing you in court"